Sawflies spend the winter inside tough cocoons beneath the pine tree. Insects are masters of chemical warfare. In previous episodes of Bug of the Week, we learned about the noxious monarch butterfly (NEED LINK TO AUG 8TH, 2005)and dogbane leaf beetle(NEED LINK TO JULY 18, 2005). These insects consume herbaceous plants containing toxic compounds, heart poisons to be specific, and in turn utilize these compounds for their own defense. But caterpillars and leaf beetles are not the only insects to use plant-derived chemicals to ward off enemies. This week I happened by a large pine tree whose branches had been curiously stripped of their needles. A closer inspection revealed a gaggle of gregarious larvae with creamy white bodies, rows of black spots, and bright scarlet heads. These magnificent creatures were the immature stages of the redheaded pine sawfly. With an arched back and a mouthful of noxious resin, this sawfly larva is ready to put up a fight. Although their appearance is quite similar to a caterpillar, they belong to entirely different part of the insect realm. Caterpillars develop into moths or butterflies. Sawfly larvae develop into a wasp-like insect known as, well, sawflies. Sawflies are so named for an appendage on their abdomen called an ovipositor. The ovipositor is shaped like the blade of a saw and is similar to the stinger owned by more well known members of the clan, the bees and wasps. Instead of using the ovipositor to defend a hive or to paralyze prey, sawflies use their ovipositor to slice small slits in the needles or bark of a tree and deposit eggs within. The eggs hatch into larvae with insatiable appetites for pine needles. Black pine, Scots pine, and Mugo pine are among their favorites. 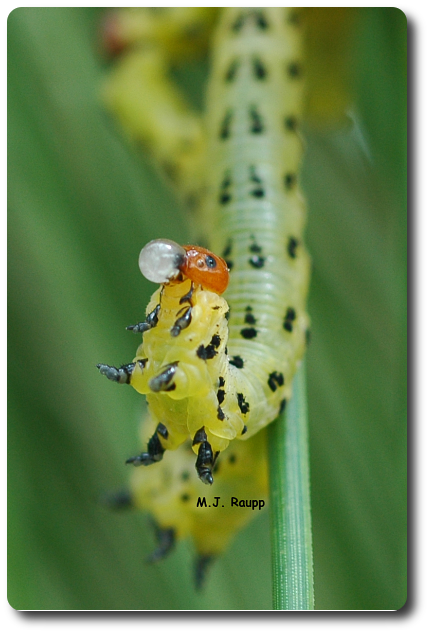 Sawfly larvae travel and feed in a group. Group feeding may help larvae overcome the tough surface of the pine needle. When one breaks through to the tender tissue below the surface, others in the group gain access in this cooperative venture. But feeding in large clusters may also attract the attention of curious entomologists or, worse yet, hungry predators. In this case, sawfly larvae have a rather nasty trick up their sleeve or should we say in their belly. Sawflies are primitive relative of bees and wasps. Large pins through their bodies really hurt. In a series of fascinating studies, Thomas Eisner and his colleagues discovered that the gut of a sawfly larva contains two extra pouches attached to the esophagus. As a larva eats pine needles, the pouches are used to store the sticky aromatic resins of the pine. When harassed by a predator or startled by a bug geek, the sawfly arches its back, empties its pouches, and regurgitates a large sticky droplet of odorous resinous fluid. With the head up in the air, the droplet is held in a position likely to be encountered by an attacker. Spiders, ants, and even birds are known to be dissuaded by this nasty oral fluid. Two or more generations of redheaded pine sawfly appear and savage pine trees each season before they enter the duff beneath the tree and spin a cocoon to survive the chilly winter. Although they are quite entertaining to watch, large numbers of sawflies can put a real hurt on a pine tree. They are easily controlled by simply removing them with pruners or by hand. Information for this bug of the week came from “The love of insects” by Thomas Eisner, Belknap Press, 2003. This great book contains many fascinating stories about bugs and their strange little lives. 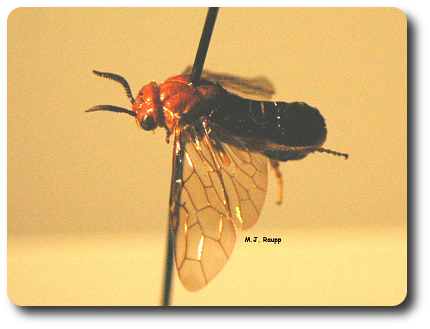 To learn more about sawflies, please visit the following web sites.